Son of Frankenstein (Universal, 1939). Lobby Card (11" X 14"). Horror. This was the third of Universal's Frankenstein films, and the last worthwhile entry before the series dissolved into sequels without the Boris Karloff monster. At 51 years of age, Karloff was getting too old to deal with the eight hour makeup job by Jack Pierce. 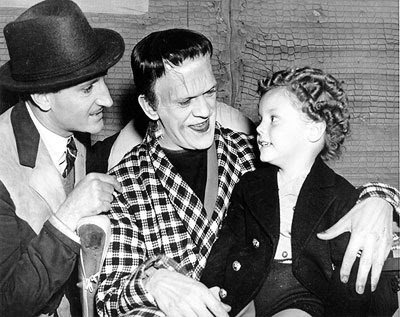 The previous two entries, Frankenstein (1931) and The Bride of Frankenstein (1935), were big hits. In this installment, Basil Rathbone portrays the son of the famed doctor, and Bela Lugosi is Ygor, the demented hunchback. Starring Boris Karloff, Basil Rathbone, Bela Lugosi, Lionel Atwill, Josephine Hutchinson, Donnie Dunagan, Emma Dunn, Edgar Norton, Perry Ivins, Lawrence Grant, Lionel Belmore, Michael Mark, Caroline Frances Cooke, Gustav von Seyffertitz, Lorimer Johnston, Ward Bond, and Dwight Frye. Directed by Rowland V. Lee. An unrestored lobby card that displays signs of use. May include slight edge wear, creases, pinholes, or stains. Please see full-color, enlargeable image above for more details. Fine/Very Fine.